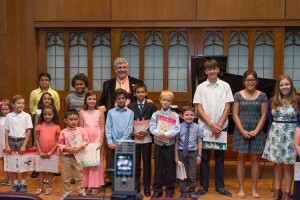 Students at KeyNotes Piano Studio have some of the most sophisticated learning tools available today at their disposal. Jaime Garcia-Bolao is an early adopter of music-learning technology to aid in the education and growth of musicians. He has been utilizing computer technology since the mid 90’s, and was exposed to it since it first became available during his formation as a musician and teacher in the early nineties. From the use of midi accompaniments to programs that enhance and hone memorization techniques, to sight-reading, music history and appreciation, and composition, Mr. Garcia-Bolao is uniquely experienced in the technology that 21st century music students need in order to succeed. Mr. Garcia-Bolao also often uses iPads and laptops during lessons in order to keep students interested. While the students use the technology to learn, they do not do so in a vacuum. Mr. Garcia-Bolao works with the student, using the technology to create a coached atmosphere in which students receive feedback both technologically and personally.